Published on January 12, 2010 in Bands/Artists, Eastern Iowa, Music, Out and About and Upcoming Show. 0 Comments Tags: "thrill jockey", Chad Taylor, Chicago Underground, Delmark, Duo, Live, Orchestra, Quartet, Rob Mazurek, Upcoming Show. 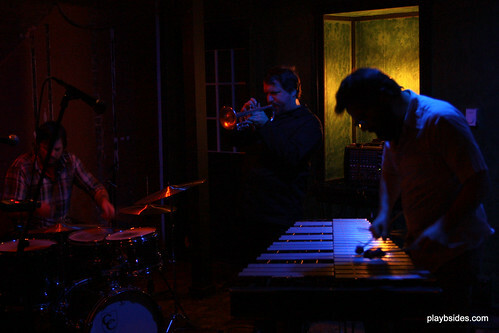 In what seems to be shaping up to be a Thrill Jockey invasion of Iowa, it has been announced today that coronetist Rob Mazurek’s avant garde jazz vehicle Chicago Underground will be performing at The Mill Restaurant in Iowa City on Thursday, February 18th! This will be the Chicago Underground Duo configuration featuring Mazurek and drummer Chad Taylor, who are the two constant members of the group which has recorded and performed as a trio (with bassist Noel Kupersmith) and quartet (with guitarist Jeff Parker of Tortoise) and sometimes as The Chicago Underground Orchestra (with Parker, Bitney and Herndon from Tortoise as well as Sara Smith, Chad Lopes, and Tony Pinciotti). The group started in Chicago borne of a standing improvisation workshop at the notorious jazz venue Green Mill. 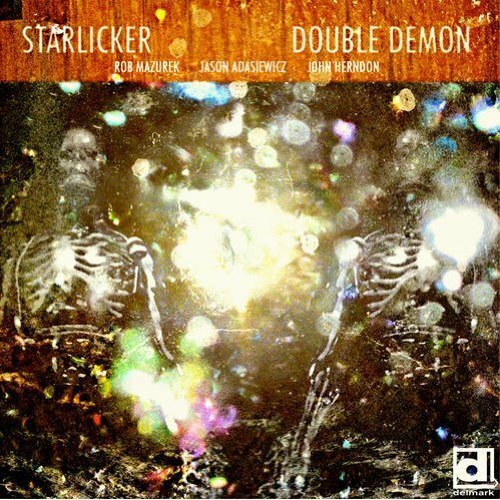 Since 1998, the collective has recorded 11 albums between the Thrill Jockey and Delmark labels, and their newest album titled Boca Negra will be their fifth as the Duo. 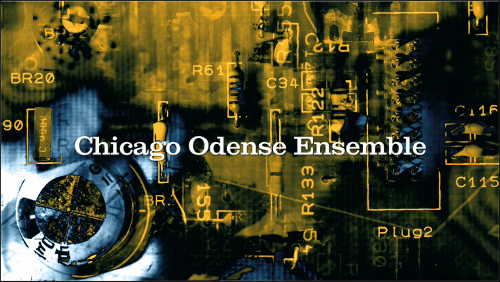 I think that The Chicago Underground Duo is a pretty interesting band configuration as it is just a percussionist and Mazurek on coronet, although they sometimes bring other instruments along for their live show. I’ve never seen this band live before, so I’m hoping to make it to this show. 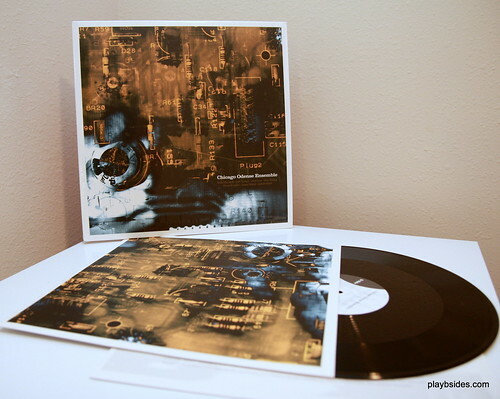 I’ve seen Mazurek’s other project Isotope 217 before (on the 1998 tour with Tortoise). Isotope 217 is less improvisational maybe more like Tortoise in some respects. 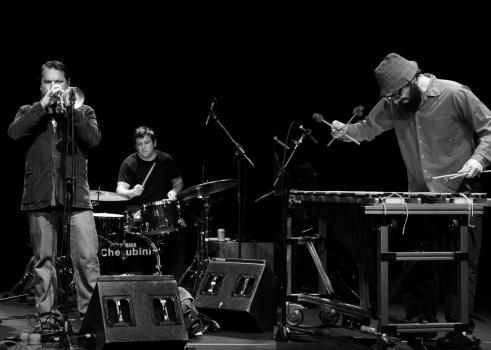 The Chicago Underground Duo will be bringing their flavor of avante garde improvisational jazz to The Mill Restaurant in Iowa City on, Thursday, February 18th. Admission will be $8 and the show will start at 9PM. An opening act has yet to be announced. Click Here to visit Thrill Jockey’s Chicago Underground page where you can stream whole albums from their catalog. Click Here to visit The Mill Restaurant’s calendar page to get more details on the show. Click Here to listen to “Spy on the Floor” from Boca Negra. Published on December 31, 2008 in Bands/Artists and Music. 0 Comments Tags: "thrill jockey", Jason Adasiewicz. 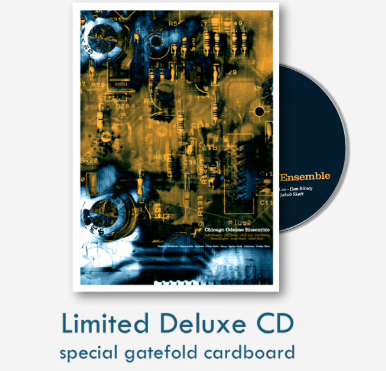 Delmark, John Herndon, Josh Abrams, Matthew Lux, Rob Mazurek, sound is, Tortoise, Town and Country, upcoming release. Glancing through coronet player-slash-self-proclaimed “abstractivist” Rob Mazurek’s list of albums he either performed on, or led one gets the idea that he’s a pretty busy guy. Indeed, in 2008 alone he had three releases– one with the Exploding Star Orchestra and Bill Dixon on Thrill Jockey, one as part of his Sao Paulo Underground on Aesthetics and a solo release called Abstractions on Robert D’Arbrissel on AdLuna. 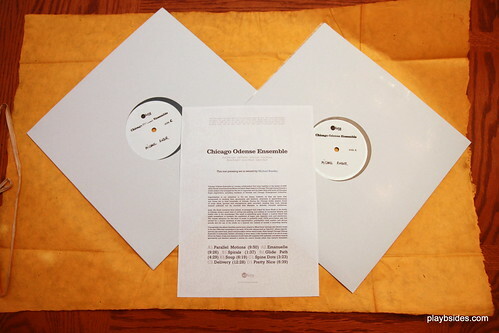 Rob has a number of releases on his second Chicago label home (the other being Thrill Jockey) the seminal Jazz and Blues label Delmark dating back to 1998’s Playground as part of Chicago Underground Orchestra. 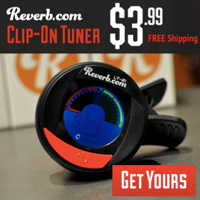 On February 17th, Delmark will be releasing sound is (Delmark DE 586). 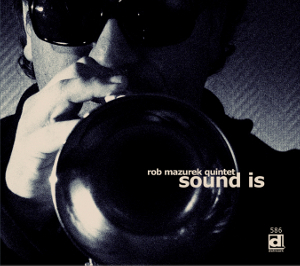 Featuring 14 new compositions, sound is is the debut of Rob’s new quintet which includes John Herndon from Tortoise on drums, Josh Abrams of Town and Country on acoustic bass, Jason Adasiewicz from Loose Assembly on vibes and Rob’s bandmate in Isotope 217 Matthew Lux on bass. 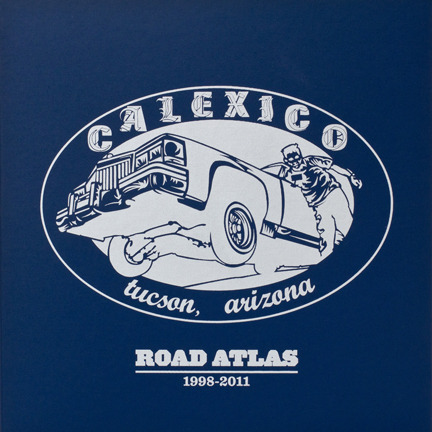 Published on June 1, 2008 in Bands/Artists, In The Bins, Music and Vinyl. 0 Comments Tags: "thrill jockey", Chad Taylor, Chicago Underground Duo, Jeff Parker, Rob Mazurek, Tortoise. Lots of Thrill Jockey-related purchases on eBay. 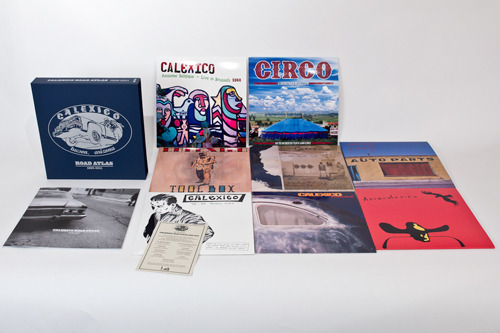 Last month I finally finished my Tortoise LP collection! I found a guy who was selling Thrill 013 aka the first Tortoise album who had “TNT” as well. He runs a small record shop in Washington and apparently gets Tortoise vinyl from time-to-time! The only vinyl missing from my Tortoise collection at this point is the “Gamera” 12″ and Rhythms, Resolutions & Clusters. 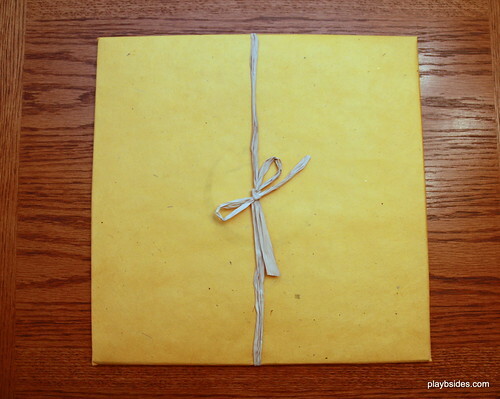 Tortoise – Tortoise (LP, Thrill Jockey thrill 013, 1994) ($20) This is not the first pressing Fireproof Press brown cardboard with brown screening and tab close cover. This is not the 1996 white with green screen sleeve either. 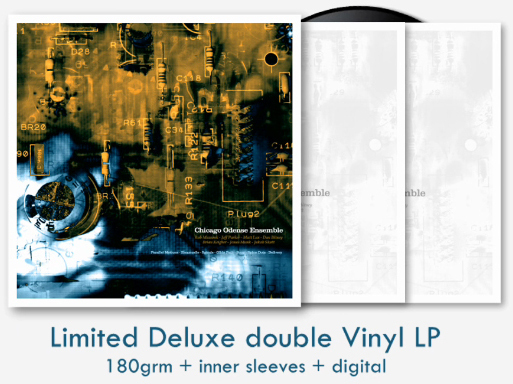 This copy is a light grey plain sleeve with orange screening. I have seen this version frequently on eBay, but I don’t know if this is also the second pressing or if it is a third one. Tortoise – TNT (2 LP, Thrill Jockey thrill 050, 1998) ($30) This release is probably the most popular release from Tortoise, and as such seems to be driving the price of the vinyl up. Expect to pay upwards of $40 without shipping for a copy of this. I can now rest easy having finished this collection! Tortoise – Universal Buzz presents… Tortoise (CD-R, Universal Buzz Radio / Quantegy, 2001) ($9) This is a CD for a syndicated radio show called Universal Buzz Radio. This seems to be a show from the 1998 tour. Unfortunately, there isn’t any information on the CD or a tracklisting or what venue or city. An interesting piece for my collection. Chicago Underground Duo – In Praise of Shadows (CD, Thrill Jockey thrill 168, 2006) $4) All four of these came from one auction which closed around $17 after shipping. 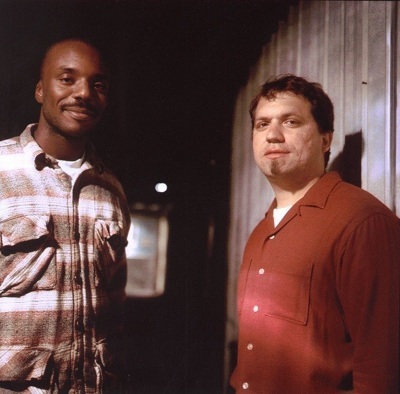 Chicago Underground Duo is the pairing of Rob Mazurek and Chad Taylor. These albums range from just the duo to albums with sidemen including Jeff Parker. 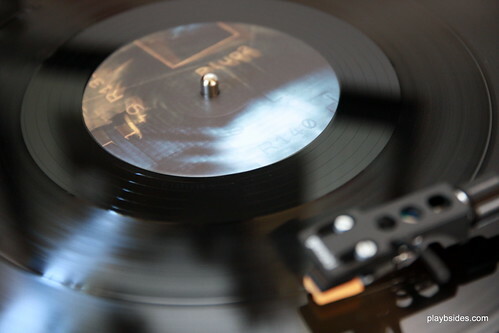 The Time to play b-sides archives for the rob-mazurek tag.